John Terry: England's best signs new deal, praises Mourinho and the 21 partners he's had at Chelsea! Fantastic news yesterday that John Terry has signed a new one-year contract extension to remain at Chelsea next season. "I'm delighted to stay for another year. And hopefully there could be a few more years after this. The honesty that he had with me when he first took over, basically: 'play well and stay in the team. If not there will be other players that will come in and step in'. He just demands that from everyone on a daily basis. He's doing everything right at the moment. We're top of the league and everyone's hungry. We're very close at the moment. To get that big one at the end of the season would be fantastic. Then we can regroup and go again next year. I'm delighted to be here and hopefully there's going to be many more." 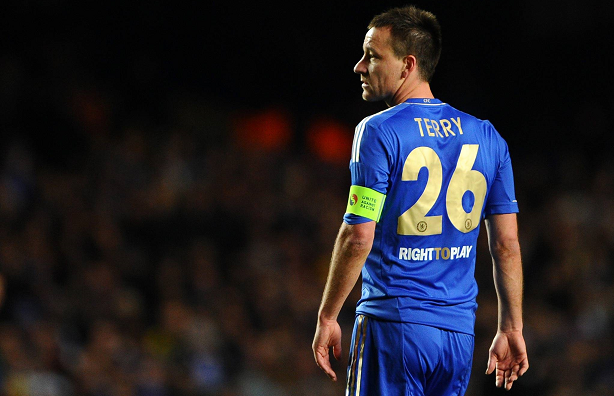 John Terry might be loathed outside Chelsea - but he is England's best defender. Not since 2005-06, in fact, has Terry been recognised by his peers as one of the two best central defenders in the Premier League - a remarkable statistic. Terry was in the PFA team of the year for three successive seasons up to then but has not made it since. That is eight years since he was chosen as one of the two best centre-halves in English football. Terry was voted in the Uefa Team of the Year on three occasions – in 2007, 2008 and 2009 – in a poll conducted among fans and not players, with the bulk of those supporters coming from outside England. In those same years he was also in the FifPro World XI which is voted for by players. If Terry's popularity is in doubt, his quality is not. He has been and is a remarkable defender who has astonishing powers of recovery, single-mindedness and resilience. And he can defend in an era when there is a dearth of defenders. That has highlighted his qualities even more. There is not only a premium on centre-halves in the way there used to only be on strikers, which has driven the prices up, but there is an increasing lack of options. It is a dying trade. Clubs are scratching around to find players capable of playing the position. With England there is Gary Cahill, Phil Jagielka, Chris Smalling and Phil Jones in Roy Hodgson’s current squad with John Stones being held back for the under-21s. But there are few other options beyond that small group. Gone are the days when England could take Carragher, Ferdinand, Sol Campbell and Terry to a World Cup as they did in 2006 with Ledley King missing out through injury. Three of those outstanding players have retired while Ferdinand is seeing out his career at Queens Park Rangers - which leaves Terry as the last man standing from that generation who is still playing at the very top level - for his club, at least. Harry Kane, the league’s top scorer and man of the moment, recently said Terry was the hardest defender he has faced so far in his career after his performance in the Capital One Cup final. “It taught me what a brilliant defender he is, so much experience,” Kane said. Terry has not been sent off for five seasons and been booked only once this campaign in the Premier League and only five times in the past three years. According to Opta statistics he has already won 38 tackles compared to 29 last season and has conceded just nine fouls. He has won more tackles, more headers, made more blocks, more clearances, more headed clearances, more passes and created more chances than Cahill, Jones and Smalling. Terry has been motivated by Mourinho and by Chelsea’s policy of only offering 12-month extensions to players in their 30s and has also been helped by the breaks he can take – such as now – during the international periods. It has been a remarkable comeback by Terry and one that he should be recognised for. Hopefully he will finally return to that PFA team of the year even if he will no longer be in the England team. John Terry's twenty one different defensive partners. This article in the Daily Mail has put together a great article about JT's longevity and the twenty one different defensive partners he has had in the Chelsea first team. Alex, Tal Ben Haim, Winston Bogarde, Khalid Boulahrouz, Jeffrey Bruma, Gary Cahill, Ricardo Carvalho, Marcel Desailly, Michael Duberry, William Gallas, Jes Hogh, Robert Huth, Branislav Ivanovic, Tomas Kalas, Joel Kitamirike, Bernard Lambourde, Frank Leboeuf, David Luiz, Michael Mancienne, Emerson Thome and Kurt Zouma! Granted, some have only made a couple of appearances with JT but some others have been the cornerstone of Chelsea's success and the rock the team built from. Players such as William Gallas and Ricardo Carvalho back in the day have been our most successful pairings with JT. The question is, who do you think has been the best ever pairing with JT? So to John Terry and my thoughts on his new deal. As you have seen, I personally think that he is England's best defender and would still be the Captain of his country if he was still able to be. There isn't another inspirational character I can see in other clubs such as Terry. Vincent Kompany comes close but has nowhere near the same experience as our Captain. Never afraid to literally grab hold of a team mate on the pitch to give them a talking to and to re-establish what is expected, he has the respect of everyone in the game on that pitch. As for the hassle and the stick he gets around the grounds and in the newspapers? That doesn't affect him at all. If anything, it encourages him to play better to prove people wrong and that's exactly what he has been doing since Jose Mourinho returned last season. Andre Villas-Boas and Rafa Benitez have to look at his performances since his return to first team action and regret the way they handled him. He fully deserves a new deal and remains the first name on the team sheet in the managers mind. His managers faith in him has obviously driven him on further than before you can see how much it still means to him to be a part of the team let alone the Captain. I said it before about Frank Lampard and I will say the same about Terry. It's only when he retires from the game that people will reflect on his career and realise just how good he is/was. Fortunately, we have him for at least another season!